2. 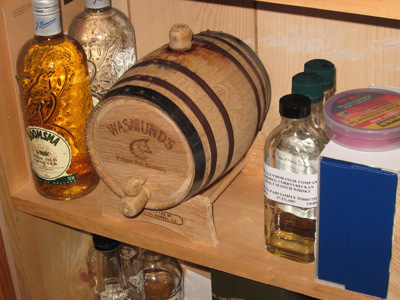 You must use the barrel provided and both 750ml bottles of Wasmund’s Single Malt Spirit, No substitutions! 3. You can add to the barrel any ingredients (as long as it won’t kill anyone). 4. 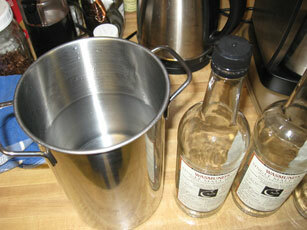 When you feel the Whisk(e)y is ready, fill the provided Blind Pig Bottle with your sample of whisk(e)y. 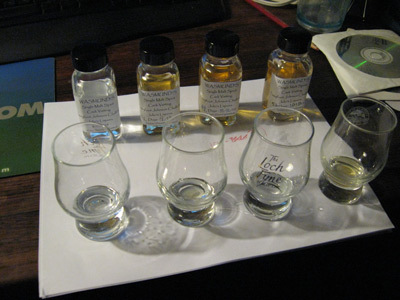 (Notice I said “sample of Whisk(e)y”, I do not want your sample of anything else!). 5. Return your filled Blind Pig Bottle to Julio’s by the deadline of December 2, 2009. Water or not to water, that is the question! 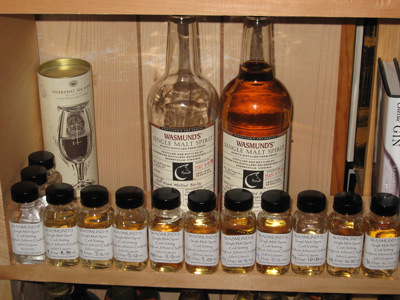 Present your Whisk(e)y how you would like it to be tasted! I will instruct the judges NOT to add water! So here's the story of how we managed our entry - stop back after Repeal Day to see how we did! This is a compilation of filings I made to Julio's Loch & Key Forum in the Pussyfoot Johnson Challenge thread. I finally started on August 4 by prepping the minicask. Blew it out with compressed air, tried unsuccessfully to char the inside a bit more with a propane torch before giving up and filling it with hot water to soak overnight. Only one tiny leak that was sealed by the next day. Drained and flushed the cask out with warm water until no debris coming out. Set up the cask in a window upstairs that has been swinging daily through temp cycles of ~70 - 90 F through much of August. 50% direct sunlight on cask through partially opened blinds. 8/14/09 - Week 2 of the Pussyfoot Johnson Challenge. Pretty much left well enough alone and simply monitored the cask for leakage through days 8-11. We sampled the cask at Day 12 and were taken aback at how much the preparatory substance had changed. Still good but moving REALLY fast and lots of color coming in here. This seems to be a VERY active cask. So we decide to stay the course and let the sleeping cask lie. Also begin preparation for mapping progress by documenting details in test log, photographed initial setup and bottles, preprinting sample labels/setting up the 60ml sample bottles, and setting up sampling calendar that will allow for time for "finishing" stage. 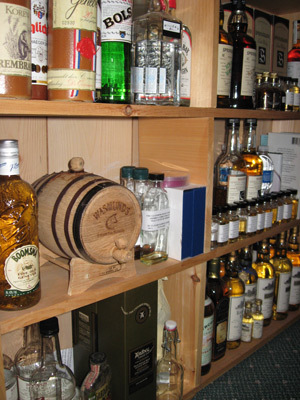 Now I need to think about decanting and racking in the Wasmund's soon. Running out of time here. 8/23/09 - Week 3 report - "all hell breaks loose"
Didn't taste the cask again since day 12 as noted in Week 2. We decide to decant the preparatory bourbon and rack in the Wasmunds on the weekend and end up doing it on Sunday April 23 - Day 18. 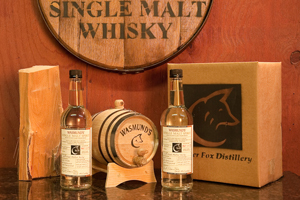 Nosing the 18 day old Copper Fox Cask "finished" bourbon it's waves of high alcohol and not much else. Initial taste also all alcohol at very high proof. Check the ABV with a hydrometer and it measures 52% but it still drams like >65%. I think I broke it since this was a wonderful bourbon to start with and that we lost tons of water here. More on this botched pre-experiment later. Given that I lost so much volume in this first 18 days (probably because it was stored in too hot conditions) I decided I needed to fill the cask so I used 2 bottles distilled on 3/9/09 and one bottled distilled on 5/8/09. I vatted them into a larger container and pulled a 60 ml sample of the vatting off along with samples of both bottles for reference. Filling the cask it took exactly the rest of the vatting so the cask capacity was 2,070 ml. Serendipity. We'll taste weekly and pull 60 ml samples every 2 weeks thru decanting. 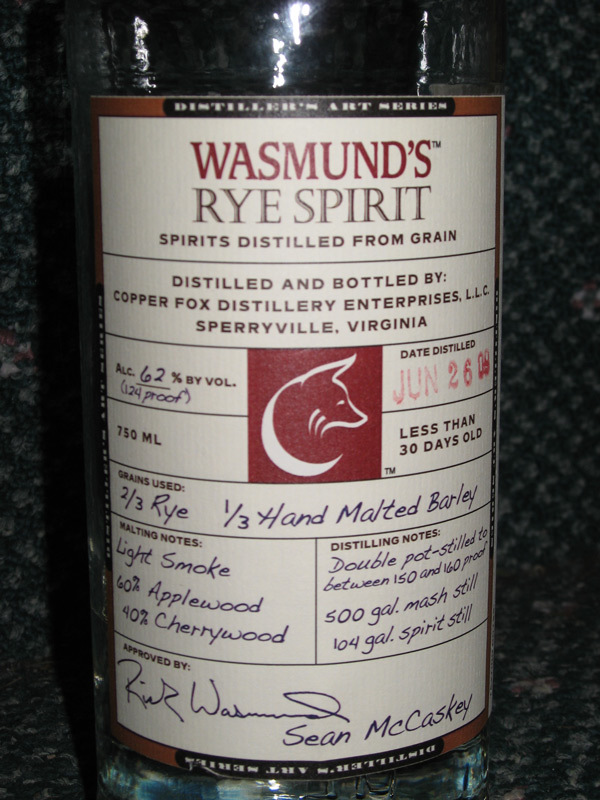 ps: still haven't tasted the Wasmund's single malt spirit yet since I'm obsessing over the ruined 4 Roses bourbon at the moment. One crisis at a time. Not much to report on Weeks 4 and 5 except to note we decided to pull samples weekly after checking out the change in color after only 7 days. 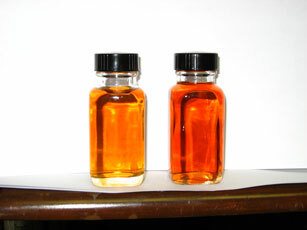 Below is a photo of the new make vatting we used and samples pulled after 7 days and 14 days in the mini barrel. Not much change in color from 7 to 14 days. We totally drained all the 4 Roses Bourbon from the barrel before filling with the 3 bottles of Wasmunds so the bulk of this color should be from the wood. Still haven't tasted any of these yet but will do so and post my tasting notes after supper tonight. I've procrastinated long enough! This is pretty cool - this month's (Vol 18, No 3) issue of the Malt Advocate has a writeup of this barrel challenge on page 83, No reference to PFJ or this forum though which I think was a missed opportunity since the PFJ angle would have made this writeup more interesting IMO. Better yet, you can now access this article online since John Hansell started offering free digital subscriptions this month and providing the full mag online. and just navigate to page 83. Here's a photo of the new make and the first four weekly samples. 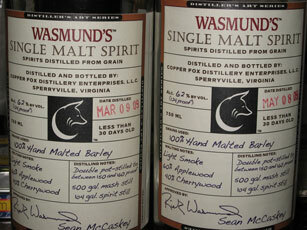 Wasmunds Single Malt Spirit, 100% hand malted barley, light smoke with 60% applewood and 40% Cherrywood. Bottled at 62%. 1. New make distilled 3/9/09: Soft fresh cut grassy nose with sour new make edge. Palate is strong apple and cherrywood, very green and pretty much undrinkable. I used 2 bottles of ths in the barrel vatting (No 3 below). 3. 2.25 liter vatting of 2 x No 1 and 1 x No 2 above to completely fill the cask. More pungent nose that either of the components. Palate is best of 3 presenting a harsh but rounder palate finish. Finish favors liquorishness of 2 with some citrus emerging before going a bi sour and unpleasent. This puppy needs work! 4. 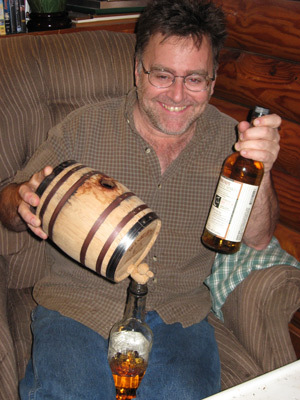 Aged 7 days: Wood evident on nose and the ragged green whisky edges starting to disappear already. Much better palate. less harsh with oak noticable on the back palate with a touch of cinnamon. Finish still numbing though. 5. Aged 14 days: Nose has more wood, citrus starting to fade away. Palate is similar to the 7 day sample but sweeter with more wood and noticably less green. Finish starting to clear up nicely too. 6. Aged 21 days: Similar progression as we've seen so far. Nosing very well against the unaged fill spirit and getting more spicy. 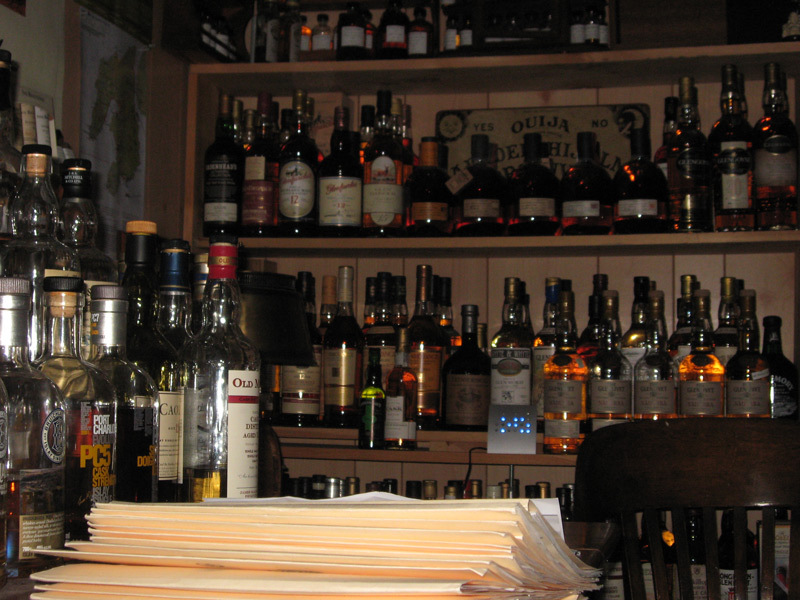 Wood is kicking in quite hard without much color showing in the whisky. Lots of cinnamon in the spicy tart finish now. Marginally drinkable now but no where near quaffible. 7 Aged 28 days: Almost all the new make heavy edginess gone now. Still green but no longer ragged at all. Similar to 21 day old with more wood and cinnamon coming on. Palate definitely getting rounder and fuller with more oak showing up everywhere on this dram. With water they all calmed down a bit but the 21 and 28 day old samples responded best here with the 28 yo almost enjoyable at about 50%. Overall I'm surprised and quite pleased since I figured they were fairly dormant based on the small color shift. Another warning about how radioactive these small barrels are. We'll pull a 35 day sample on Sunday and I'll give the barrel 3 days of more volatile temp swings between now and then to see if we can get some more color happening. 9/27/09- Week 8 report - 3 weeks prep and Wasmunds now aged 35 days. Color starting to come in nicely - you can see the change is running fairly consistently. Never got it upstairs so it's been in the cellar now the entire 35 days. Still getting better. Nose is still young but all the harsh green new make is gone. Oak coming up strong and working well with the apple and cherry smoked malt whisky. Palate is much cleaner with oak and spicy resin predominant - but not in a bad way. Warm vanilla starting to come in on finish. Astonishing to taste it against the new make and see how far it's come in just 35 days. Still have some room to work with here and am going to let it ride for another week. I'm moving it into the upstairs bedroom where the temp swings more for the next week. I'll have to watch it closely. Anyone else sample theirs at 5 weeks in wood? 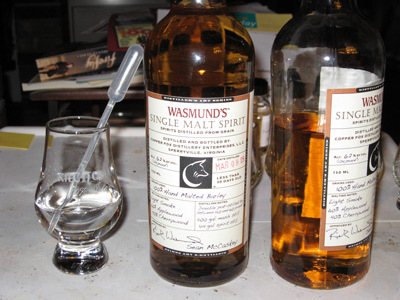 The Wasmunds Single Malt clearic has now aged 42 days, the last 7 upstairs in the location I ruined the Four Roses I used to season the barrel with (see my week 3 or 4 report for this sad story). Despite moving the cask to a more active temp location it didn't really pump up the color much but I think I did get a bit more. Nose is still a bit green but much less grassy with more spicy and nougot notes coming in. Nice improvement from the 35d sample and it's come an astonishing way from the 7 day sample which strikes me as sweet and sour grain today. Very grassy. Can't find the apple or cherrywood in the 7d sample at all. Palate: much more mature than nose but still could use more time - big improvement from last week. All the hard edges are being rounded off nicely and the palate is solid aromatic oak with apple and citrus on the back palate. The 35d sample palate is all over the map and I can see where it's going now. The change in this dram in the last 7 days is amazing. Finish is huge and ringing... (I think the ringing is the high proof.. I've been dramming these cowboy style for the most part.) Some minor off notes that still need work and it wanders a bit on the back side but I like where this is going. 35d finish is really still a bit industrial so the finish has really changed a lot the last week as well. I don't recognize the 7d finish as even being related to the 42d - opposite sides of the taste spectrum with the 7d almost mildly menthol and mint-like. I guess this means that although I'm not getting lots more color in the dram that the hotter more active location is quickly changing the malt's character and this barrel will need to be watched closely over the next couple of weeks. I've also pulled 540 ml in samples from the original 2.25 liters which leaves me about 1.6 liters (minus the angels share) left in the barrel which increases the head space. 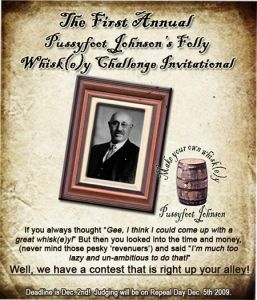 Ok, it’s time for the week 11 Pussyfoot Johnson Challenge Report. 3 weeks mini-barrel prep and 8 weeks maturing Wasmund's barley cleric in wood. Below is a photo of the new make, 7, 21, 35, 49 and 56 day aged spirit. 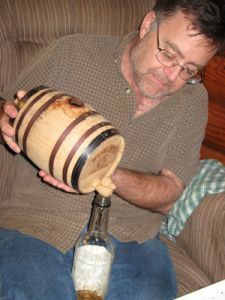 I think I broke the back of this minibarrel when I tossed the Four Roses off the cliff in a mere 18 days. Today I’ll report on the progress here by tasting the New Make, 21. 49 and 56 day old. With water it goes spicy again and the coconut/vanilla palate fade way into the background again. Not what I expected at all. Even the nose is a bit spicier. I knocked it down maybe 5% here. Watered the other samples down similarly and none responded like the 56 do sample did and didn’t stray off their core profile much. The 56 day sample is definitely shifting from the earlier samples in some fundamentally different ways. Now to watch it closely to decide when to pull the plug and put it into glass for Phase II. 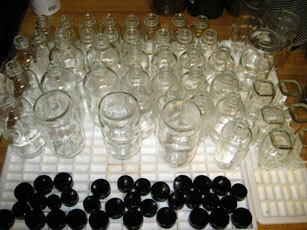 === ok, it's about 10 min later and I'm cruising up and down the sample bottles as they breath. The difference between the 49 and 56 do samples are amazing and this dram is shifting rapidly - I predict we'll empty the cask within the next 14 days. After being opened a half hour the difference between the new make and 21 do is stunning. More proof how active these mini barrels are. PAY ATTENTION! We of course focus on the 56, 63 and 70 day samples and use the new make and 28 DO samples as reference. Amazing transformation between the 56 - 70 samples. No green left in the nose on the 63 and 70 with slight hints in the 56. Nose on 63 is smooth vanilla with hints of citrus and coconut while the 70 is noticeably spicier and with wood present. On dramming 56 clearly needs more time and although good, could be better. 63 is amazing and really light and almost ethereal. With water it opens up and gets lighter still. Finish is a little short though with a tiny bit of sour left on the back of the tongue. 70 is happening though - total shift to the spicy side from the 63 with lots of vanilla and toffee caramel on the palate and finish. It has a bit of a rye edge to it now that I can only think is from the wood. This is perfect, although I also like last weeks and may have pulled the barrel then if we had tasted it when we poured off the sample. Although tempted to pull off only a part of the cask and let the rest go further, we decide it's ready and decant the cask back into the original bottles for more family photographs. Ok, that's done and now comes the final alchemy. What proof to submit it in? What final finishing might be the trick? What late night voodoo will transform this into the winning entry? 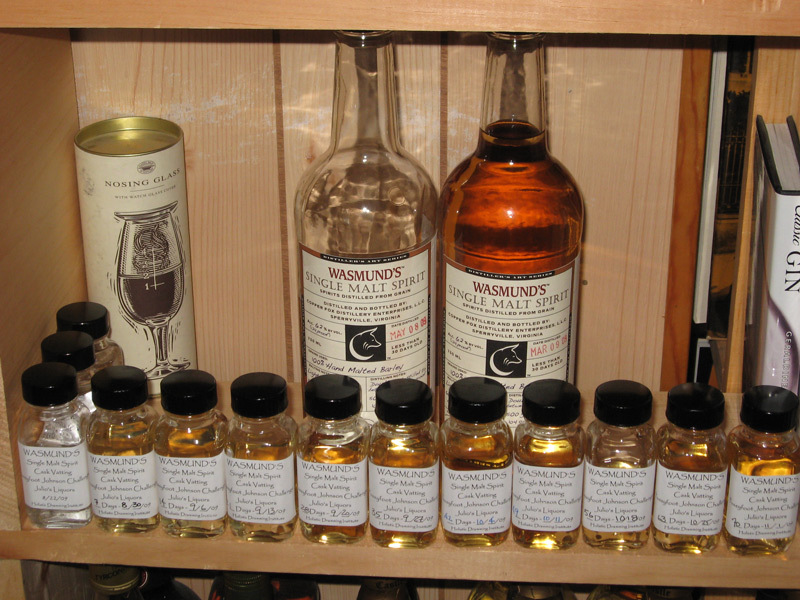 Here's a photo of the samples all together with the finished whiskey behind it. 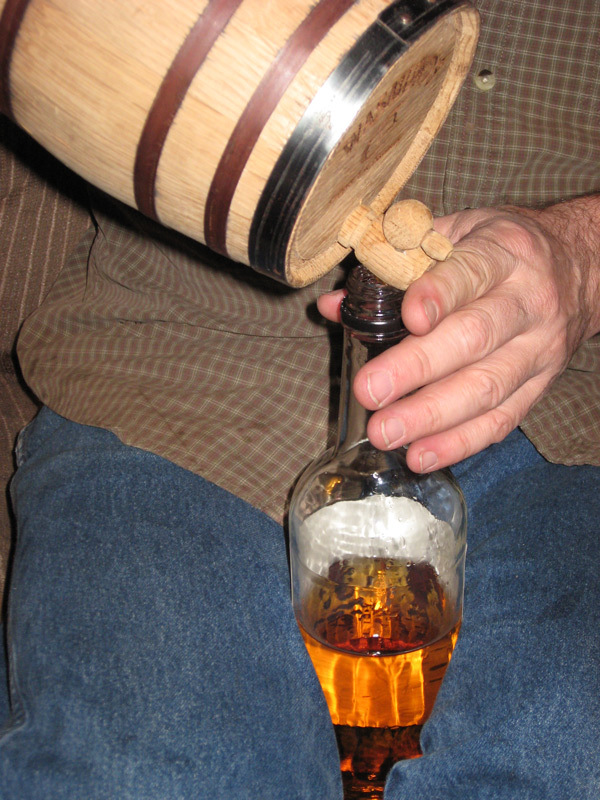 11/1/09 - What to do with an empty Cask? Well, refill it of course! 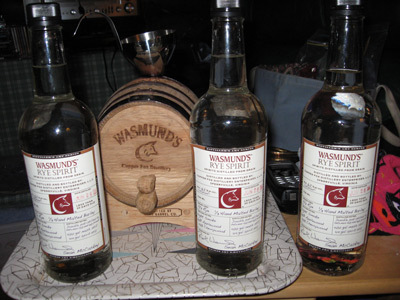 Today we decanted our Wasmunds Single Malt Spirit from our Pussyfoot Johnson Challenge minibarrel and refilled with Wasmunds Rye Spirit. 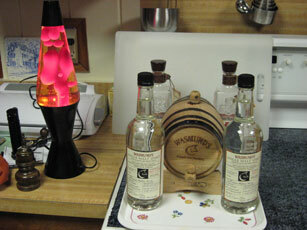 We used three bottles distilled on June 26, 2009 from 2/3 Rye and 1/3 Hand Malted Barley and bottled at 62%. Like the Single Malt Spirit, the malted grain was lightly smoked with 60% Applewood and 40% Cherrywood. This is the second use of this cask and it was bought new in August. 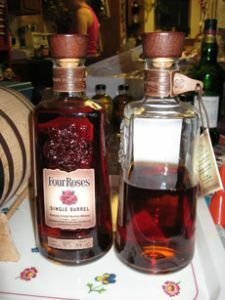 Seasoned with 2009 Julio's Single Barrel Four Roses and ruined the 4 Roses in a mere 18 days. Undrinkable... I have free samples! 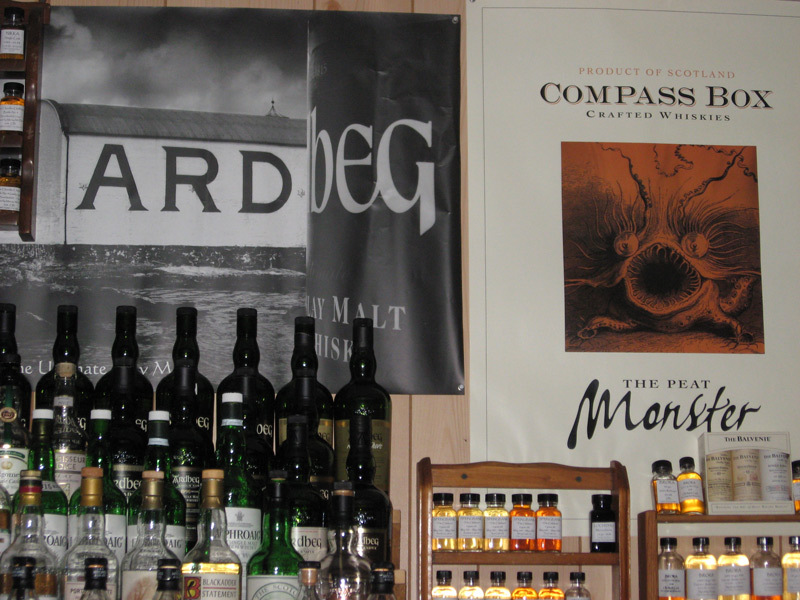 Refilled with Wasmunds Single Malt Spirit and aged for 70 days. That went a LOT better. Emptied and immediately refilled with Wasmunds Rye. Going to keep this barrel in the cellar and take our time aging this spirit. Here it is in it's new home in the HDI. Near the door so we'll remember not to forget. I'm not too worried about the cask this time and am thinking I may leave this in a bit longer. We'll pull a one week sample and then probably every 2 weeks after that.